Natural gas storage in excavated mines has been limited to only a few mines worldwide. The primary issue with CAES storage in a mine is the integrity of the mine structure: high-pressure air containment is typically poor because of the active geological environments associated with mined ore deposits. 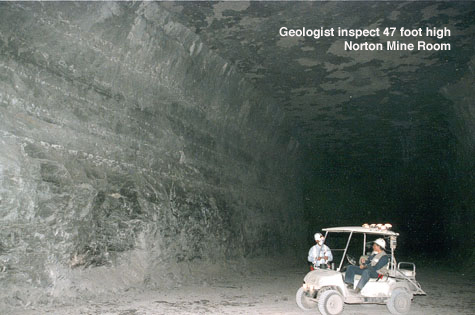 The Norton mine is unique because of a very stable geological environment and extremely low permeability limestone mine host rock. Specifically, Hydrodynamics and Sandia drilled over 600 feet of core samples, performed laboratory analysis of the core for rock strength and hydraulic properties, performed microscopic thin-section analysis, performed high pressure in-situ testing, performed in-situ stress measurements, numerical modeled air migration from the mine, and conducted a finite-element rock strength modeling analysis. The results of our research demonstrated the Norton Mine is cable of supporting approximately 2,700 MWe CAES power plants. 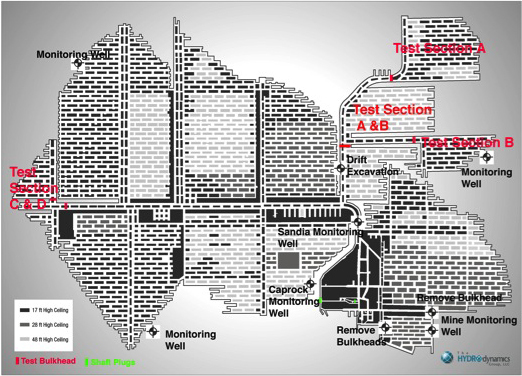 Hydrodynamics is providing technical support to First Energy to start construction of the Norton Mine CAES power plant project. Hydrodynamics is one of the few groups to fully characterize a mine for CAES, model mine CAES performance, and design the mine storage system. In addition to the Norton Mine, we evaluated the Pilot Knob Mine in Missouri for CAES performance.